Since Sinai, the lessons of Pirkei Avos Ethics of the Fathers have been the foundation of Jewish character and personality, of morality and ethics. They are the road map toward the goals of happiness, fulfillment, and personal growth, as defined by the Torah. 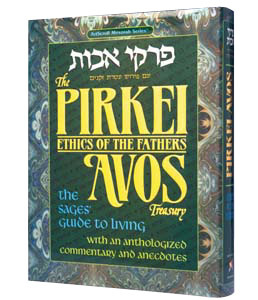 Pirkei Avos brings together how the Sages actually lived, the standards they set, and the ethical teachings that have guided and inspired Jews century after century, to this very day. This magnificent anthology includes insights and anecdotes. It explains the text of Avos with clarity and explores its implications through the prism of every day's practical challenges. This beautiful gift edition is perfect for every occasion that calls for something special. And it is ideal for daily study or occasional browsing. 8-1/2" x 11" page size, ribbon place-marker, gilded, embossed jacket. Contains full Hebrew vowelized text; new flowing translation; anthologized textual and inspirational popular commentary; the sages' guide to living in a magnificent gift edition for year-round use.